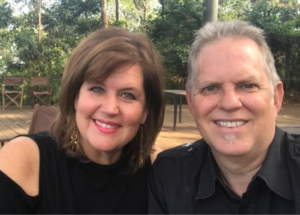 Since 2017, Pastor Joel and Stephanie Midthun have been the executive directors of Courage House in Moshi, Tanzania, a home and school for victims of human trafficking who are under the age of 18. Stephanie started as a volunteer at Courage Worldwide in 2008 and then joined the staff in 2011. Joel also became a board member in 2011. Now they currently support 14 girls in residence, two of their toddlers, two pregnant young women and three others who are attending advanced education or vocational training. The Midthuns oversee a staff of 16 nationals including their executive team: the house manager, a social worker, and an education officer. They provide training to pastors, leaders, students and young adults on the topic of human trafficking, and the effects of trauma on emotional health. The Midthuns also partner with the Evangelical Lutheran Church in Tanzania to train their leaders and pastors, working together to prevent trafficking, locate victims and start more homes in Tanzania for victims of trafficking. In 2019, they hope to double their capacity and house forty girls and four children. Please visit their website to learn more about their incredible work and other Courage Houses.